For a team to win games, the best players have to play. For the best players to play their best, they need to be healthy and perform. Responsibility for keeping them here belongs to the performance staff. This task proves to be easier said than done, for one, because large roster sizes make it near impossible to manage the day to day requirements of your athletes. This is where the staff needs help wherever they can, and performance technology is stepping up to that role in all new ways. New technology is helping training staff members keep track of these large groups by prioritizing where time and attention needs to be spent. This allows greater control of the group and helps flag any potential issues or understand when to push them harder. 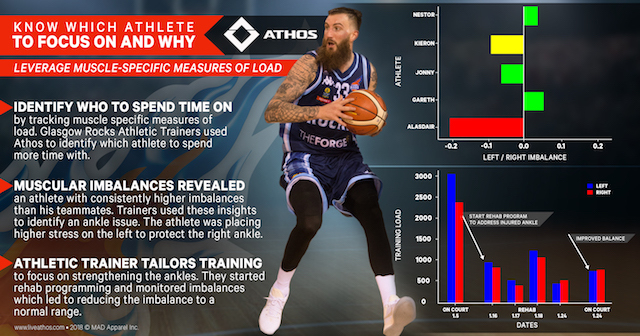 The Glasgow Rocks, a professional basketball team in Scotland, have been using Athos both in practice and in game to track how their athletes are responding to the various stressors of a professional season. The Glasgow Rocks’ Athletic Trainer, Kurtis Ashcroft, was thrilled to try out Athos on these athletes because he felt ultimately it would help him to do his job more efficiently. Kurtis has every player wearing Athos gear, in fact, the team made it a requirement. This was great because it allowed Kurtis to have a rich data set for each athlete so that he could spot trends and notice inefficiencies. This really paid off when Kurtis and the training staff noticed one of their star players, Alasdair Fraser (Ali), was experiencing repercussions from a lingering right ankle issue. The trainers flagged this because a massive imbalance continued to occur during weight room training, practices and games. Kurtis knew that Ali had some right ankle issues in the past that had bothered him from time to time, but they didn’t think it was worth taking him out of games and dedicating a rehab program to his ankle. But this imbalance they identified proved that it was worth rehabbing his ankle so he could play at his optimal level in game to help the team win. Once Kurtis and team identified this issue being worthy of fixing, they formed a hypothesis that Ali was more heavily relying on his left side due to pain and weakness in the right ankle. 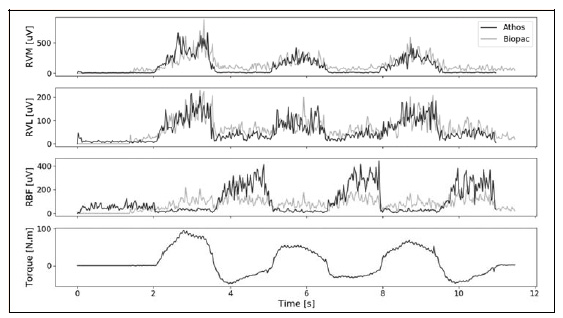 As the right ankle pain became more prominent, his left imbalances increased. To stop this pattern, Ali’s game and practice time was first reduced and then a rehabilitation program was put into place to address the issues underlying the imbalance. Kurtis and the rest of the training staff spent a lot of time discussing the findings from Athos. Once they flagged the imbalances, they could easily identify what the potential issues were as the injury came to light. Kurtis used the data to confirm that he did indeed need to be shutdown and that they needed an individualized rehab program set up for Ali to start his road to recovery. Figure 1. 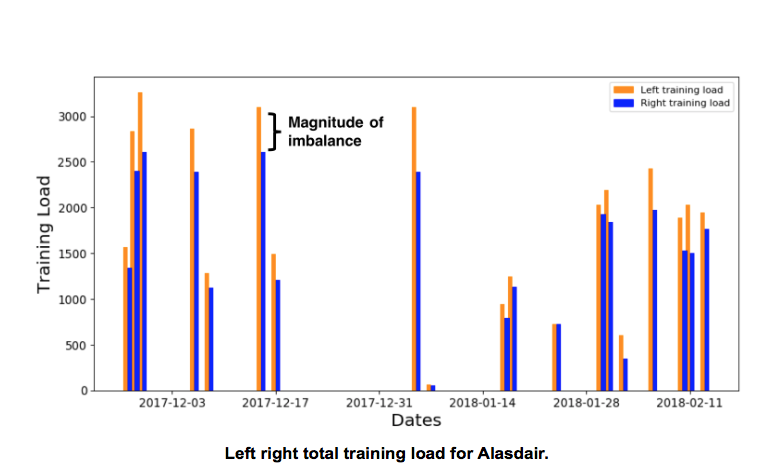 The left and right training load for practices and games for Alasdair. 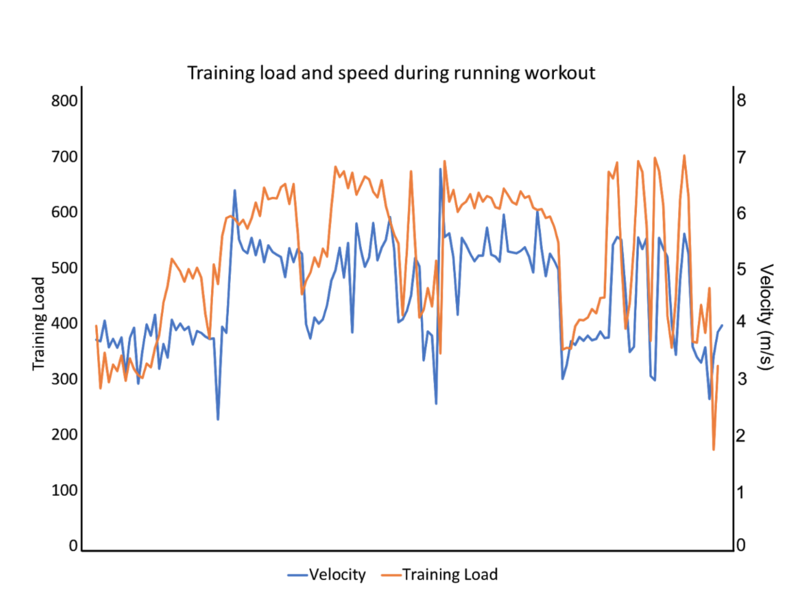 The orange (left) training load is consistently higher than the blue (right) side. Rehab for this injury started near 1/03. Ali’s imbalances improved ahead of schedule, within about two weeks of starting his Return to Play protocol, and the performance staff was impressed with how quickly he progressed. He no longer has any pain in his right ankle. Ali progressed above and beyond what was expected and was back on the court much sooner than the physio anticipated. He’s officially back in the gym doing the usual team sessions. Before every game, he does extra band work to make sure he’s properly warmed up. During the training warm up, he does a few ankle dominant exercises like dot drills, pogos, hop-sick-hold, and inch worms. Kurtis also does pair drills for fun which help loosen the soleus, hips and knees. Then Kurtis and Ali also did back-to-back squats and balance drills. All these movements have helped to keep Ali game ready and confident in his abilities. After the balance normalized, we could try and understand what may have caused the original issues Ali experienced. These outliers gave the performance staff a plan to move forward with some test and retest opportunities. Since this rehab, they’ve been looking into a different issue that was identified by using Athos. Ali’s quad contribution is overcompensating left. His hamstring and posterior chain contribution is greater on the left side. Kurtis had Ali do some tuck jumps as a part of his warm ups to help with this. He complained that this aggravated his lower back and has been aggravating ever since. He has a weakness in his posterior chain. There’s some hypothesising around whether this stemmed from his right ankle or is an underlying issue. Moving forward the performance staff plans to continue monitoring Ali during training to see how they can use the data to inform their decisions with his programming. Having Athos to help identify issues with players was key to maintaining health and keeping the best players in the game. If you’d like to learn more about how to use Athos to keep your players performing at their best you can click here to learn more.